Hey guys, figured I'd post this to build upon the Mosrite database a few of the posters have here and also for your own viewing pleasure. Quick backstory: I've been a fan of Mosrites for years. I was in high school when I first came across a picture online. After seeing the prices they ran for, I wrote off the possibility of owning a real one and looked instead to the Univox copies, of which I own a Univox Hi-Flyer bass. My grandfather passed recently. We unfortunately weren't close, but that's related to issues not regarding him. 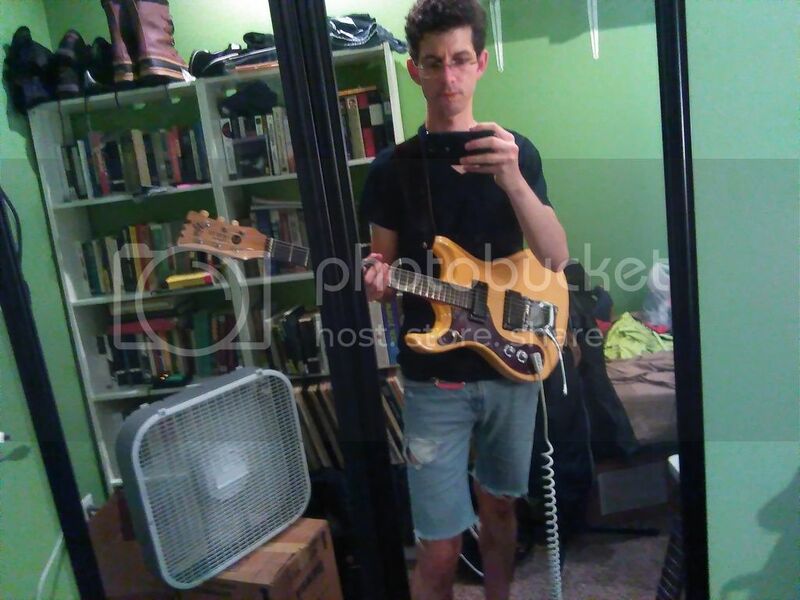 Anyways, I knew he played guitar and knew he had some old guitars, but I never inquired in detail about it. My father found one of the guitars and said he would probably have just thrown it out, but that he knew I liked old guitars, so he wanted for me to look at it to see if I wanted it. 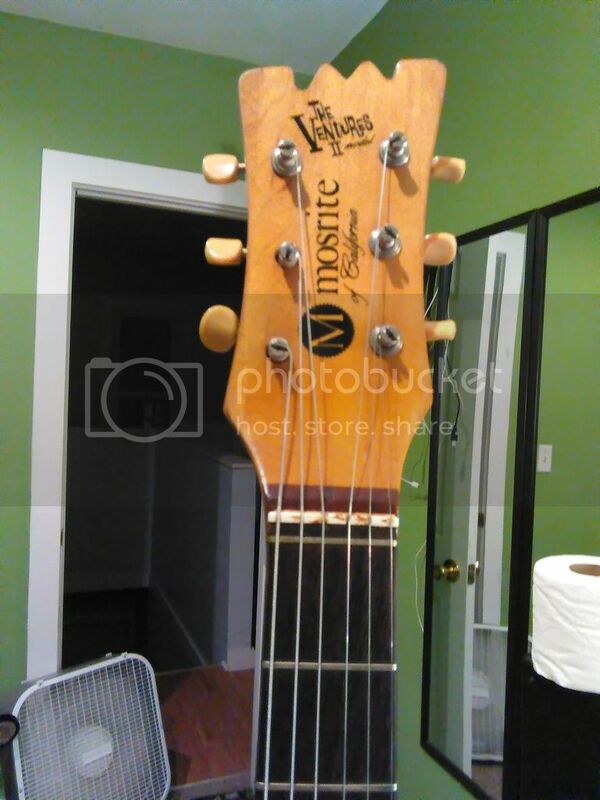 Then he pulled this guitar out of its case and I recognized the headstock immediately. To be totally honest, I still can't believe I own this thing. It wasn't kept in the best environment over the years, but the neck is straight and the electronics work fine. I'm still getting used to the thin neck and tiny frets (my other guitars are 25.5 scale with otherwise Les Paul specs), but this thing screams. When my jaw dropped after my father showed me the guitar, he asked if it was worth anything. I told him what it was worth and that I would never sell it. It's an heirloom and plugging it into an amp verified that. Pictured also is my '79 Memphis neck-thru. As I said, if there is any other technical info you'd like to know, I will provide it. As well, if you all have any info you could provide me, I would greatly appreciate it. I've been a gear head since I started playing guitar and always love to learn new things about what I've got. I have original bridges if you would like one to make it all original again. Congrats on the guitar! 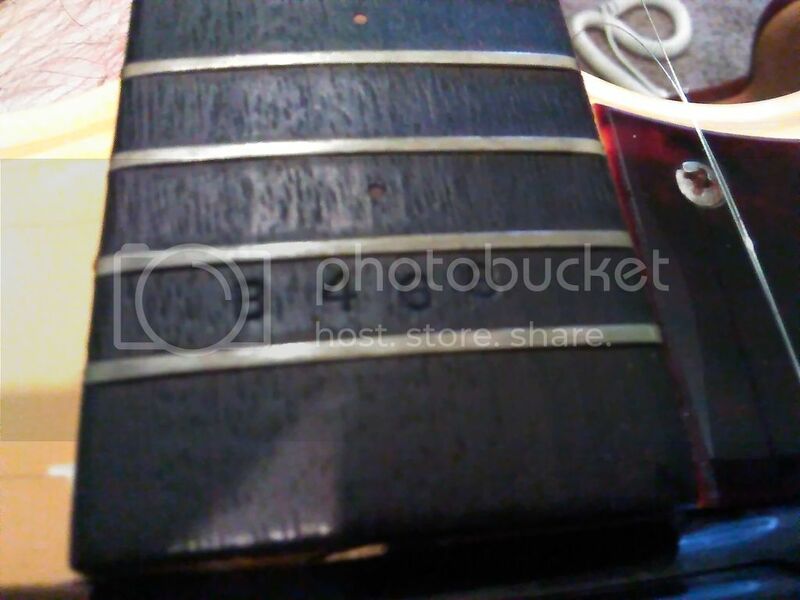 Has the tailpiece been moved back away from the neck in order to fit the new bridge in? Bob Shade wrote: I have original bridges if you would like one to make it all original again. Congrats on the guitar! 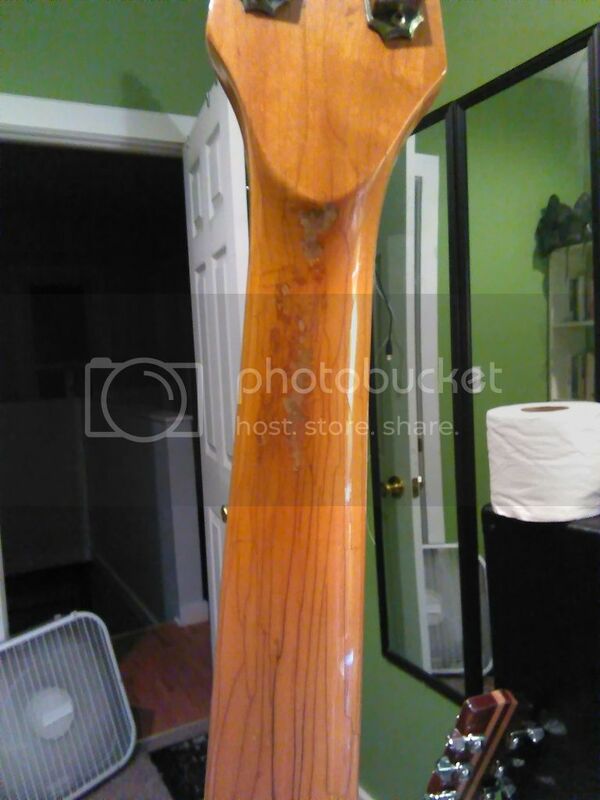 Mr. Bill wrote: Has the tailpiece been moved back away from the neck in order to fit the new bridge in? Actually, I hadn't recognized that the bridge had been swapped out. The tail piece is original and has not been moved--I took the tail piece off when I wiped the guitar down after receiving it and there were no additional holes drilled. 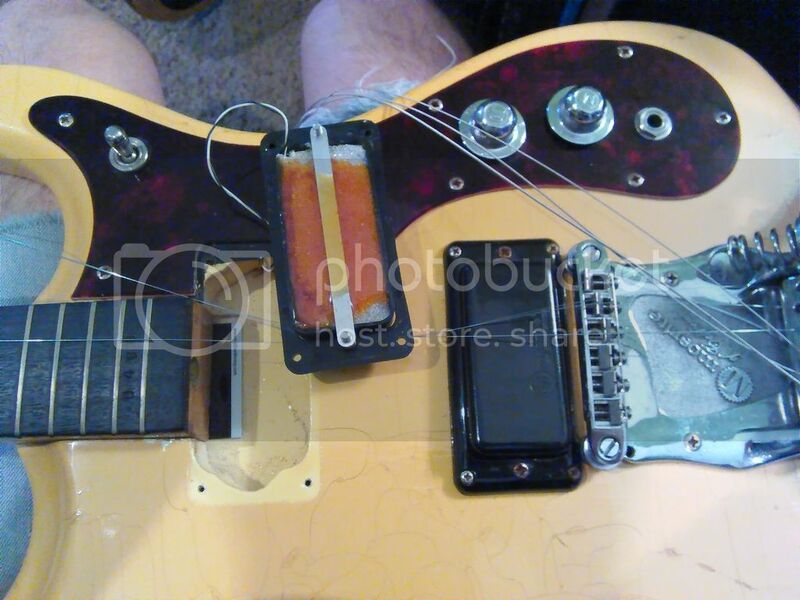 It looks like my grandfather, for whatever reason, replaced the old bridge and drilled holes just above the tail piece between it and the bridge pickup to fasten the bridge there. I noticed, and you may be able to see this in the pictures, that the two top screws on the tail piece (where it appears the original bridge was fastened) are missing. I'm glad you guys mentioned this because the intonation is between an 1/8th and a 1/4 tone sharp. I initially thought that my grandfather set the neck a little too deep in the body, so I slid it out as far as I could, but doing so didn't come close to fixing the problem. Now the problem is clear. @Bob Shade: I'd love to get my hands on an original bridge, but I'm a poor graduate student living on a TA stipend, and the prices I see on some websites are a little too high for me to justify purchashing right now (especially considering I just spent a few hundred bucks swapping out all of the electronics on the Memphis--totally worth it, I should add). What are your prices? Nice to see another one. I have one that's a little later in date and serial number. I think mine was Sunburst originally and for some reason the neck of mine also has a misshapen area in about the same place as on yours, from the heel to just behind the middle of the neck between the second and third frets. I've seen at least one more guitar from this serial range with the neck like that. Also, for some reason mine had a serial number that was filled in and re-stamped. 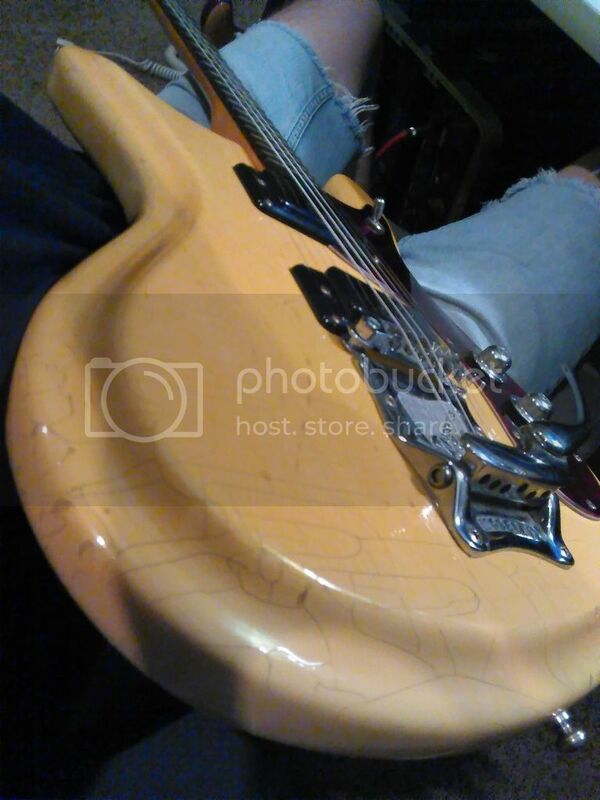 Is the other guitar an Ibanez Artist? I recognize it as Andy Partridge played a mid-1970s model. 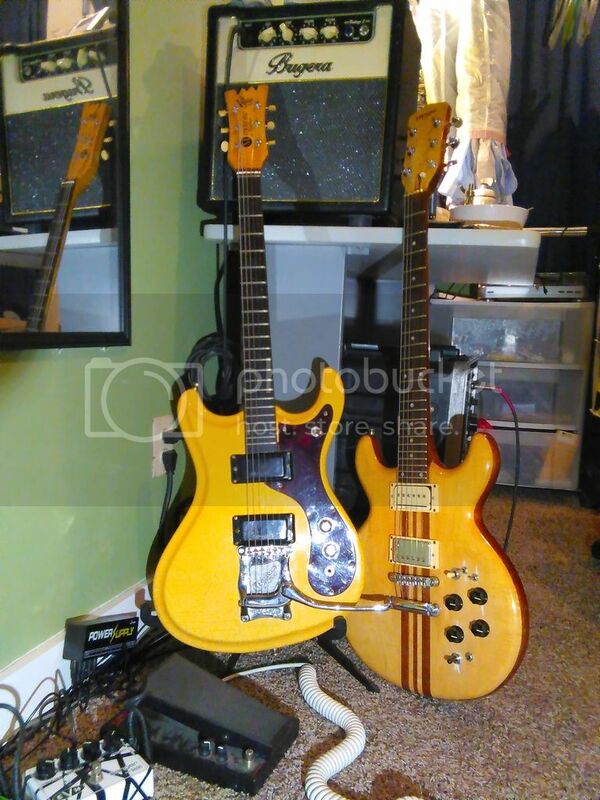 I have NOS Mosrite bridges. They sell for $199.00. Having said that since you are not in a great position right now, PM me and let me know what you can do and I will work with you. It comes with the adjustment screws for the plate that you will need. I'm considering some cheaper alternatives to the stock bridge. With t the current bridge is mounted a half-inch forward, the intonation issues are getting annoying. 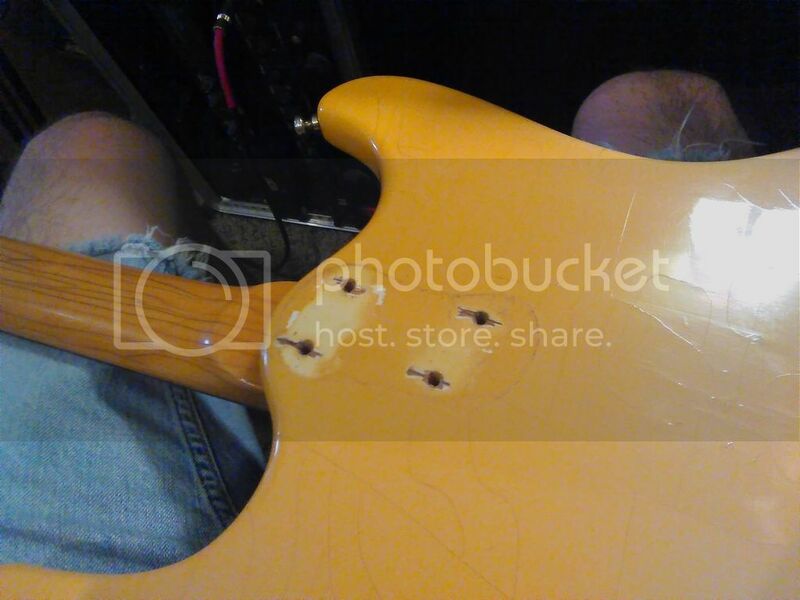 Considering the fact that Semie apprenticed with a Rickenbacker luthier, I have a hunch that a Rickenbacker bridge's mounting screws should fit the tail piece holes. If the don't, it's no issue because the holes on the base plate can be widened. The string string spacing on the Rick bridge is shorter than the current after-market bridge, and I'm surmising that it is probably very close to the string spacing on the original rollermatics. I'm more of a Les Paul guy than a Strat guy anyhow, so the Rick bridge will give me the ability to raise it up high and shim the neck to a tilt. @Bob Shade: Thanks a lot, I really appreciate it. I actually just ordered the Rick Bridge though, so I'm going to give it a shot first (I was typing the message above as you posted, so I know this message doesn't quite flow in response to yours). I'll shoot you a message if it doesn't work out. Otherwise, I'll post some pics when it's finished and let everyone know how it sounds. Thanks again! 101Volts wrote: Nice to see another one. I have one that's a little later in date and serial number. I think mine was Sunburst originally and for some reason the neck of mine also has a misshapen area in about the same place as on yours, from the heel to just behind the middle of the neck between the second and third frets. I've seen at least one more guitar from this serial range with the neck like that. 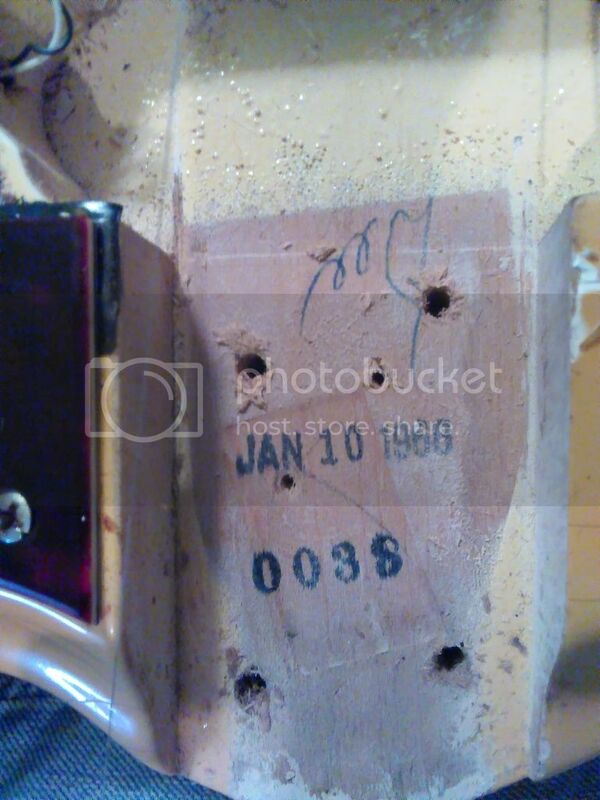 Also, for some reason mine had a serial number that was filled in and re-stamped. 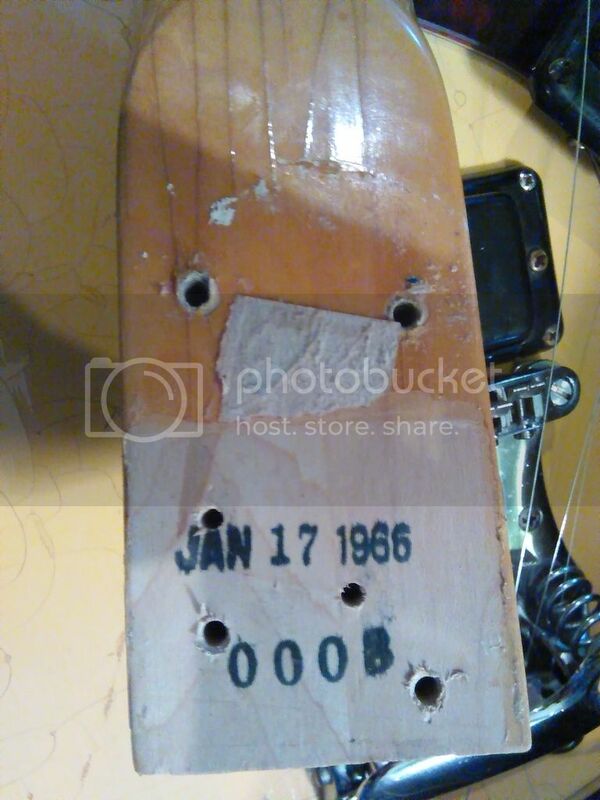 Interesting that yours has the same issue with the finish on the neck. 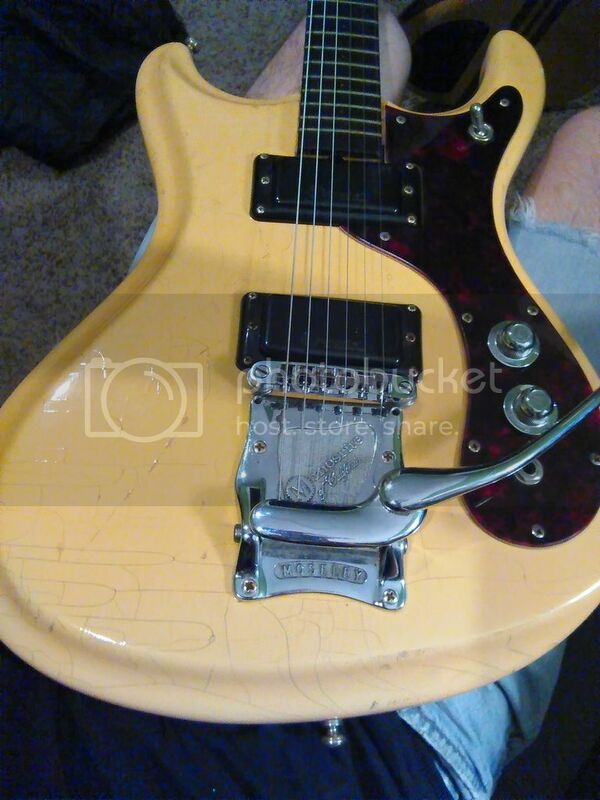 I've noticed in other pictures that the cream colored Mosrites made around the same time also have some cracks in the finish. Perhaps it coincidental, or a defect with this particular finish? It's actually a Memphis MG-300. Memphis were a lower level, often times crap company, but this guy is one of their high end models. It was made in the Matsumoku factory around '79, and Matsumoku made guitars identical to this for different Japanese guitar brands as well. My year has a maple top and bottom, with a mahogany middle, and 5- piece maple/mahogany neck, neck-thru construction, but other years reversed the wood combo, with mahogany on the top and bottom and maple in the middle. 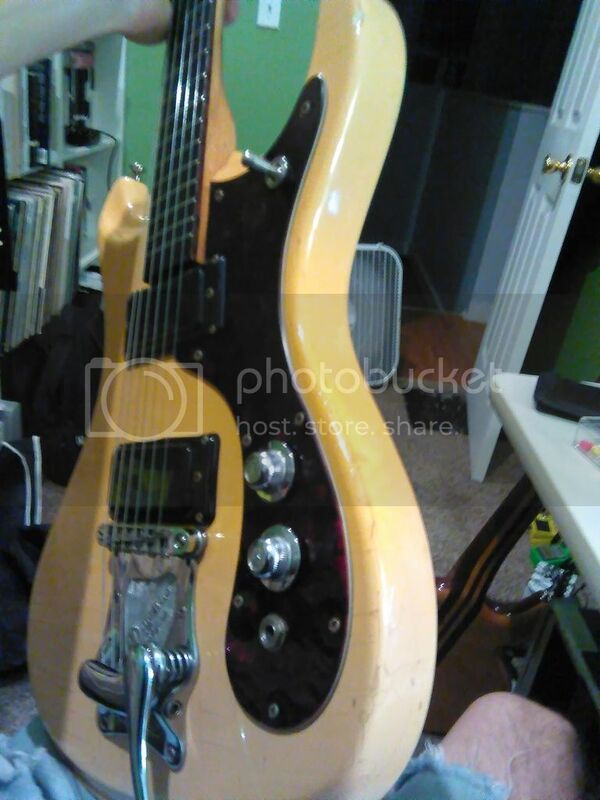 Honestly, it couldn't be a more different guitar than the Mosrite. It's got the fattest neck I've ever felt on a guitar, huge frets, a wide, very arched fretboard (which unfortunately impedes 3 step bends high up on the neck), a 25.5 scale, and it weighs in a 8.6lbs. It plays and sounds like a dream as well--it's a sustain machine. I picked it up for cheap too, for $260 a couple of months back. Nice guitar and thank you for sharing the pics. Best of fortune in grad school and with your vintage Mosrite.